Although most of you know I was not involved with the 2016 Melges 24 World Championship since about June of this year. However, since I had put well over 2,ooo hours into building, promoting, planning , and organizing this event, not to mention the hours, labor and dollars I had personally put into the Pimp My Ride Promotion there was no way I was going to miss this event. 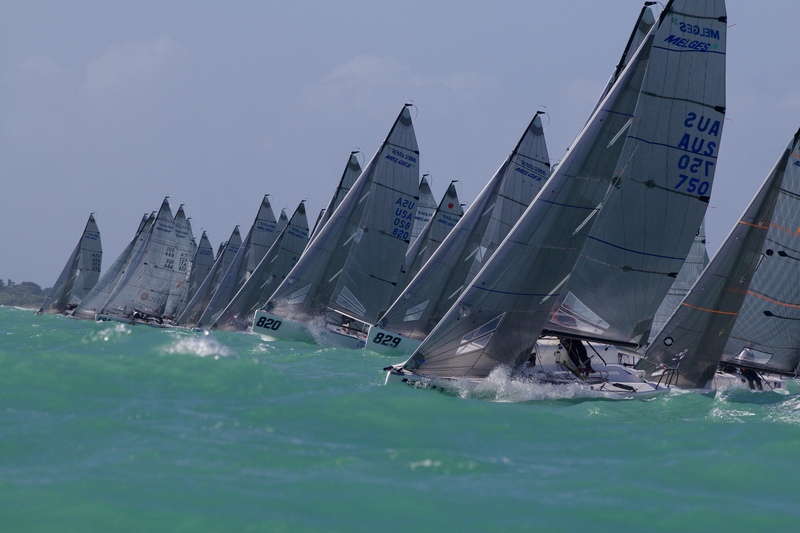 Much more on this later with a post event interview conducted by a US Melges 24 District Governor at the Miami Yacht Club bar, where I let it fly, and I let it all fly. But again, all that is for a later time. This is about what I was there for. The Pimp My Ride promotion came off very well despite many hiccups in the process, Owen Carolan arrived on Sunday Nov. 27th to see his pimped out ride. With the whole family in tow, they pulled into the Miami Yacht Club to see the effects of all the hard work, blood sweat, and stress that I had put into this campaign. Not to mention the contributions of all the industry partners and friends that helped throughout this promotion. We collected a lot of video along the way and lots of stuff to edit together that will chronicle USA 441's day at the boat spa. Again, none of this would be possible without the support of the industry partners and assorted individuals that really stepped up to help make this happen. Here is a list of everybody that helped make it a reality. If your VTNR (Value to Nuisance Ratio) was within range, your name is listed here in alphabetical order : Area 51 Global Logistics, Dan Cheresh and family, Elevation Sailing, Jonny "Nugs" Goldsberry, GT3 Creative, Harken, Line Honors, Melges Performance Sailboats, Miami Yacht Club, Musto, New England Ropes, Scott Nixon, Paxstar Specialty Logistics, Penalty Box Productions, George Peet Sailing, Quantum Sails, Raptor Deck, Chris Rast, Ruhne Racing, Sail 22, Sailing Anarchy, Tammy Sawyer and the Pewaukee Family, Blay Shoenherr, Mike Shramco, Thomas Hardware, Torresen Marine, and Velocitek. Again a huge thanks to all of these partners, friends and sponsors who stepped up to make it all happen. Stay tuned as I compile all of the footage, interviews and other specialty content to make the webisodes as promised. Lastly, I wanted to let you all know that a big gallery of pics from the worlds are now online for all to see (and purchase) here. And I am adding many more as I get them edited. The shopping cart is a bit glitchy at the moment but we are working on fixing that so you can directly purchase any pics right off the gallery page. Until then just send me an email to peter@penaltyboxproductions.com with the image number(s) and I will invoice you and send you a link to download the full poster size ( roughly 18" x 12" ) hi-res image. The holiday special rate is 50.00 per image and 40.00 each for multiple images. Once you purchase the image, you will have full range for personal use and can print as many copies and sizes that you wish.